Shirley Joan Kral died peacefully in Topeka, Kansas, on November 3, 2018, after a courageous battle with cancer. She was born September 28, 1937, in rural Home City, Kansas, and eventually moved to Topeka. She graduated from Marysville High School in 1955. In January of 1958, Shirley married the love of her life, Robert (Bob) Kral. For 26 years she worked as an insurance adjuster for Shelter Insurance, retiring in 1997. Shirley is survived by: her daughter, Debbie of Topeka, and her son, Gary of Santa Cruz, California; grandchildren, Brian (Catrina), Stefanie, Marina and Lauren; and great-grand-children, Cortlin and Natalia. She is also survived by her sister, Elaine Nolen; her beloved dog B.G.2; sister-in-law, Marilyn Callaway; and nieces and nephews, Charlene Gipson (Rex), Rick Brickei (Tracy), Larry Tenopir, Larry Linn, David Linn (Gladys), and Linda Kennedy (Terry). She was preceded in death by her husband, Bob; beloved dogs Bailey and B.G.1; parents Arthur and Verna Zech; in-laws Herman and Josie Kral; sister-in-law Della Mae; and brothers-in-law, Harley Linn and Ray Nolen. She was a “World Traveler” with friend, Philicia McKee, and they had many fabulous adventures in Africa, Europe, Australia, Mexico, India, Greece, Turkey, South America, Central America and the Caribbean. In 41 years, they made 60 trips together, visited 6 continents, and 44 countries. She was a loyal KU basketball fan, and enjoyed going to games with her nephew, Larry Tenopir. She had Kansas City Chiefs season tickets for several years with Philicia, and they attended many games in other cities including professional football, baseball and basketball. Shirley loved storm chasing with Top City Twisters, owned by her grandson, Brian. 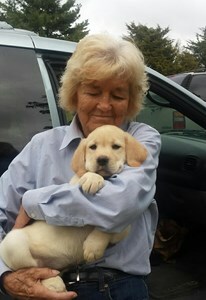 Shirley loved animals of all types, especially yellow Labradors. All types of animals loved her . . . even cats. Shirley was a devoted and faithful volunteer for Keep America Beautiful and was recognized as the Volunteer of the Year in 2010. Memorial services will be held on Saturday, November 10th at 4:00 p.m. at Dove Southwest Chapel ,3700 SW Wanamaker. A reception will follow. Private burial services will be held at a later date. She will be interred at West Lawn Cemetery alongside her husband. Memorial contributions may be made to Midland Care, 200 SW Frazier Circle, Topeka, KS, 66606. Add your memories to the guest book of Shirley Kral. Shirley was a wonderful neighbor and friend. I used to go to her house and visit with her and her dogs Gunner and Bailey. She will be missed. So sorry to hear of her passing. You are gone but will not be forgotten! I always enjoyed visiting with you and loved the time together with our lab pups. You were always so giving and kind to me. I loved your laugh and smile. I am glad you got to travel to so many neat places; that is amazing! I also enjoyed all our visits, bbq’s and Friday nights when you would come see us at 20’s West. Fri night gang will miss you too. My brother (Bob) was blessed by having a wonderful, soulmate, friend, love and for sure a lifetime companion in Shirley. They were completely in 'love' and even after two children were added to their life, Gary and Debbie, they still sit side by side in the car, at our parents home, in their home, most likely ever where they went, to the final day of Bobs very short life (35). But Shirleys love never died, she told me once she couldnt even date cause she thought it would be unfair to the gentleman she might date. That she would always compare them to Bob and they would never even come close to measuring up to Bob. Keeping those precious memories she continued on with life and was always there for his family, and whoever needed her, helping, being a complete part of his family until her final day. You always had to ask where is she off to now, as her life involved around traveling the world over with her friend Philicia (thank you Philicia) of many years. The two girls kept us informed of what the rest of the world looked like. Loads of good times , trips, cruises whatever they decided they just did. I took my first cruise with Shirley along with Debbie, their daughter, Charlene, my daughter and Rex Drescher. It was super! I will miss Shirley and her kindness, along with her happy smile, her get up and go attitude, and her radiant personality. I love you Shirley and miss you already. Now that God has sent his angels to take you to eternal peace and the greatest destination that is far greater than any you could ever experience here on earth it leaves us with peace and good memories. God bless your soul. Shirley may have been one of the most peaceful women I have ever met. Always calm. Smiling. Gentle. That’s how I remember her—oh, and always traveling with Philicia. I miss her.